The coins struck in 1924 were minted in two mints. The coins struck in Brussels have no distinctive signs. 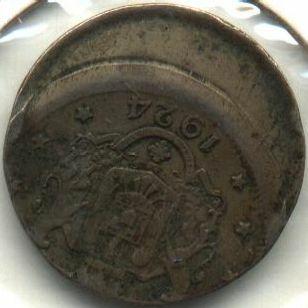 The lightning marked coins were struck at the Coinage French Society (Poissy branch). The mintages are taken from Schäffer - Stambuliu catalog from 2009. In MBR the total mintage figure for this issue is 100.000.000 pieces, 8.000 less. 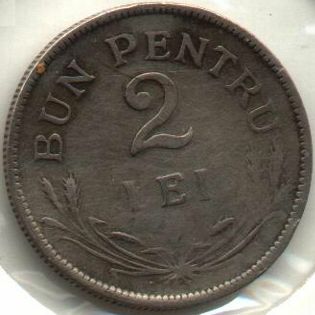 In comparison with the mintage figures given by Romanian numismatic literature, the record books of the Poissy mint  gave 298 pieces more for the 2 lei coin - 50,008,298 pieces. The city of Poissy is placed on the left bank of Seine River, at about 20 kilometers from downtown Paris, in the department of Yvelines. At the times of Poissy mint functioning, the city was part of Seine-et-Oise department. The mint of the French Company of Coinage from Poissy (l'Atelier Monétaire de la Société Française de Monnayage de Poissy) was established in 1922. The headquarters of the company was in Paris. The society was especially established for striking French 5 and 10 centimes of type Lindauer (the ones with a hole in the center, similar with the Romanian 5 and 10 bani from 1905-1906) - after WW1 in France there was an acute shortage of small change. 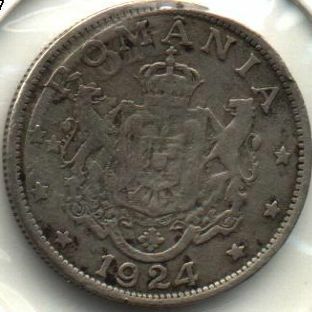 The coin production started in the second half of March 1922. The first coins were struck for Morocco. The Poissy mint had 12 coin presses, each being capable of striking around 25-30 pieces per minute. Here were struck approximately 632 million coins for Romania, Monaco, Indochina, Morocco, Greece, Senegal, Yugoslavia, Bulgaria, Uruguay - but also several millions of various tokens. For Romania the mint of Poissy struck 100,007,255 pieces of 1 leu 1924 and 50,008,298 pieces of 2 lei 1924. 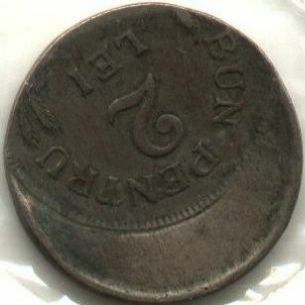 The blanks used for strIking coins by the Poissy mint were produced at Le Havre and at Dives-sur-mer (not far from Le Havre). The Poissy mint was closed on the 31st of December 1927, due to the fierce international competition on the coin producing market. le Floch, J., Éléments de numismatique. L'atelier monétaire de Poissy (Seine-et-Oise) de 1922 à 1927. (Elements of Numismatics. The Mint of Poissy (Seine-et-Oise) from 1922 at 1927.) Cercle d'Études Historiques et Archéologiques de Poissy (CEHA), Poissy, 2006. In the images below a striking error is presented. The error appeared as result of the blank displacement inside the die. 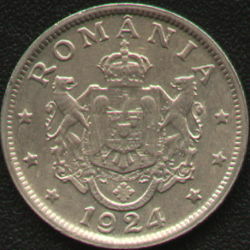 The pictures were made available to Romanian coins by Mr. Moise Alexandru-Rãzvan. 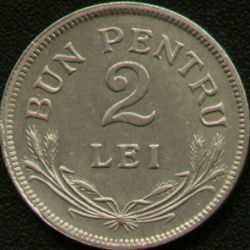 Another piece of 2 lei issued in 1924 featuring a striking flaw (most probably it has passed several times through the die) is presented below.